The Mishnah, after the Bible, is the most fundamental pillar of Jewish tradition. It represents the Oral Torah in its primary formulation. It was the subject of many commentaries, few of which surpass in depth and breadth the work of Solomon Adeni. Adeni (b. 1567) was four years old when he was taken by his parents from his native Yemen to the Land of Israel. He lived in Safed, Jerusalem, and ultimately settled in Hebron. 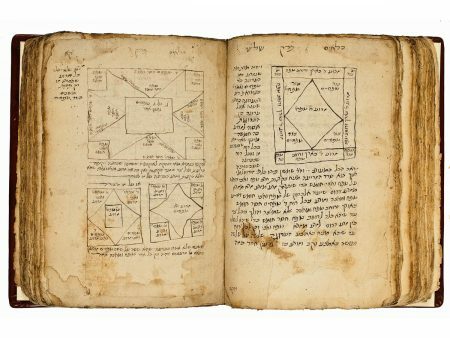 Adeni studied with the Talmudist Rabbi Bezalel Ashkenazi and the mystic Rabbi Hayyim Vital. Adeni suffered many personal tragedies, living in abject poverty and earning only a meager living teaching small children. Adeni labored on this Mishnah commentary for thirty years. He wrote it originally in the margins of the printed Mishnah edition he owned. The comments were so crowded that, after a while, the author had difficulty deciphering his own handwriting. A patron presented him with reams of paper to enable him to transcribe his notes into a coherent work. The manuscript on display here is one section of this book, which covers the first order of the Mishnah, Zera’im, which deals with blessings, prayers, and agriculture- related laws. Corrections, additions, and erasures by the author are clearly visible in the manuscript. Another part of the book, on the sixth order of the Mishnah, Tohorot, is dated 1611 (New York, The Library of The Jewish Theological Seminary, MS Rab 33). Rabbi Solomon Adeni’s contributions to the study of the Mishnah are manifold. He endeavored to establish the correct text and vocalization of the Mishnah and preserved traditions concerning the text that otherwise would have been lost. He apparently had access to libraries of manuscripts of medieval rabbinic works in the Talmudic academies of Jerusalem, Safed, and Hebron, and incorporated excerpts from them into his commentary. Further- more, he included exhaustive discussions of his own on many passages. Marx 1911, pp. 266-268; Melammed 1958; Ratzaby 1995, pp. 152–3.